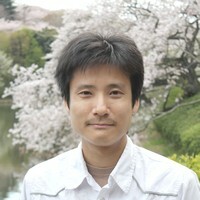 B.Sc, M.Sc, and Ph.D. at The University of Tokyo in 2001, 2003, and 2010, respectively. Works at Toshiba Corporation (2003-present). Visiting scientist at MIT Media Lab (2011-2013 and 2016-present). Real and Simulator Testbeds for Content Dissemination in High-density Large-scale WANET. Yosuke Bando, Konosuke Watanabe, Ken-ichi Maeda, Hiroki Kudo, Masahiro Ishiyama, Atsushi Kunimatsu, Hiroto Nakai, Masafumi Takahashi, and Yukihito Oowaki. Caching Mechanisms towards Single-Level Storage Systems for Internet of Things. Daniel Dubois, Yosuke Bando, Konosuke Watanabe, Arata Miyamoto, Munehiko Sato, William Papper, and V. Michael Bove. Supporting Heterogeneous Networks and Pervasive Storage in Mobile Content-Sharing Middleware. Daniel Dubois, Yosuke Bando, Konosuke Watanabe, and Henry Holtzman. Lightweight Self-Organizing Reconfiguration of Opportunistic Infrastructure-Mode WiFi Networks. ShAir: Extensible Middleware for Mobile Peer-to-Peer Resource Sharing. Kshitij Marwah, Gordon Wetzstein, Yosuke Bando, and Ramesh Raskar. Compressive Light Field Photography using Overcomplete Dictionaries and Optimized Projections. An Analysis of Focus Sweep for Improved 2D Motion Invariance. CVPR Workshop on Computational Cameras and Displays 2013. Yosuke Bando, Henry Holtzman, and Ramesh Raskar. Near-Invariant Blur for Depth and 2D Motion via Time-Varying Light Field Analysis. Transactions on Graphics 2013 (presented at SIGGRAPH 2013). Witawat Rungjiratananon, Yoshihiro Kanamori, Napaporn Metaaphanon, Yosuke Bando, Bing-Yu Chen, and Tomoyuki Nishita. Twisting, Tearing and Flicking Effects in String Animations. 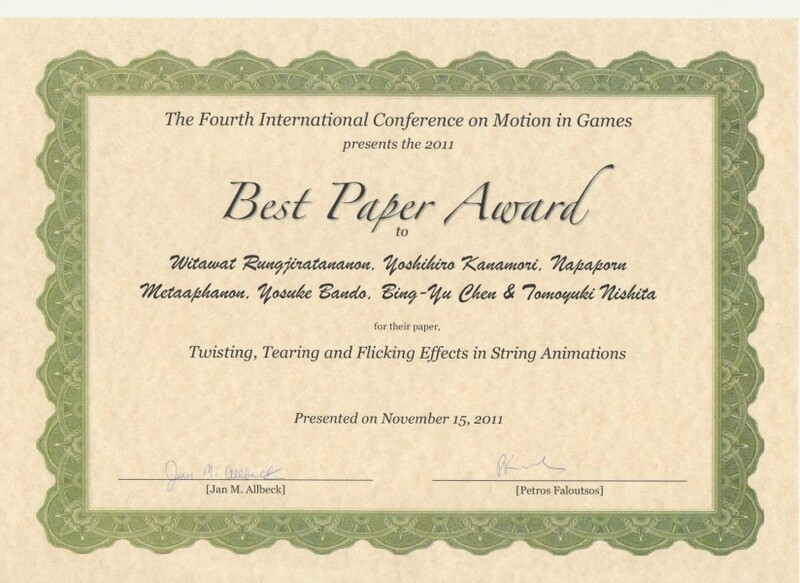 Motion in Games 2011 (Best Paper Award). Yosuke Bando, Bing-Yu Chen, and Tomoyuki Nishita. Motion Deblurring from a Single Image using Circular Sensor Motion. Paulo Silva, Yosuke Bando, Bing-Yu Chen, and Tomoyuki Nishita. Curling and Clumping Fur Represented by Texture Layers. Napaporn Metaaphanon, Yosuke Bando, Bing-Yu Chen, and Tomoyuki Nishita. Simulation of Tearing Cloth with Frayed Edges. Extracting Depth and Matte using a Color-Filtered Aperture. SIGGRAPH Asia 2008 (CG Paper Grand Prix, Japan). Yosuke Bando and Tomoyuki Nishita. Towards Digital Refocusing from a Single Photograph. Yosuke Bando, Takahiro Saito, and Masahiro Fujita. Hexagonal Storage Scheme for Interleaved Frame Buffers and Textures. Animating Hair with Loosely Connected Particles. 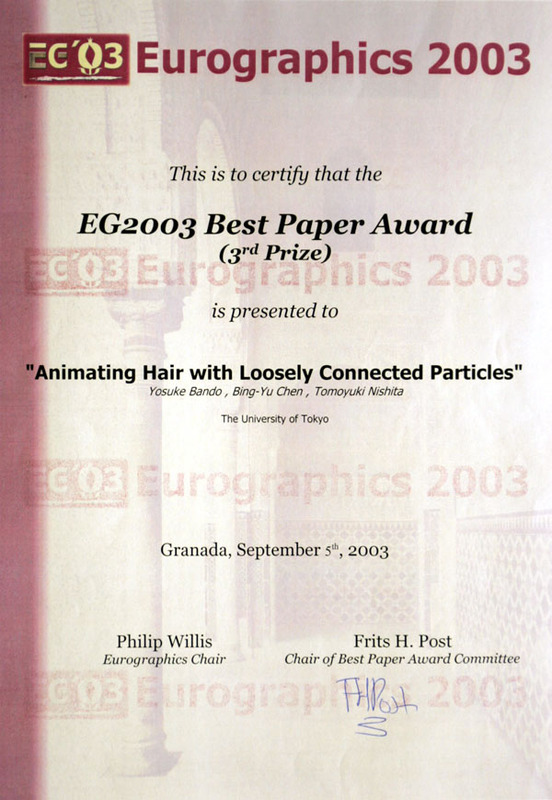 Eurographics 2003 (Best Paper Award 3rd Prize). Yosuke Bando, Takaaki Kuratate, and Tomoyuki Nishita. A Simple Method for Modeling Wrinkles on Human Skin. Doctoral thesis, The University of Tokyo, 2010. Single-Shot Image Deblurring with Modified Camera Optics. 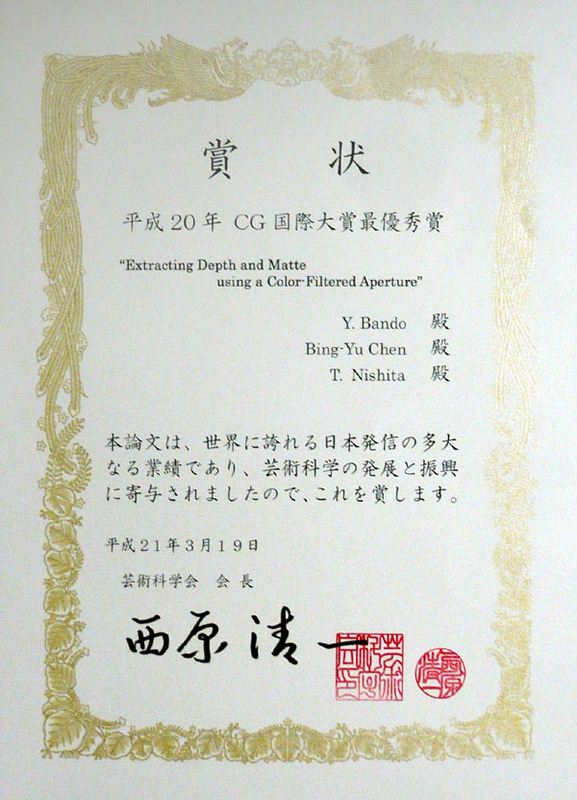 Master's thesis, The University of Tokyo, 2003. Modeling Expressive Wrinkles and Hair for Virtual Humans. Bachelor's thesis, The University of Tokyo, 2001. Human Skin Simulation by Generating Wrinkles along Vector Fields.